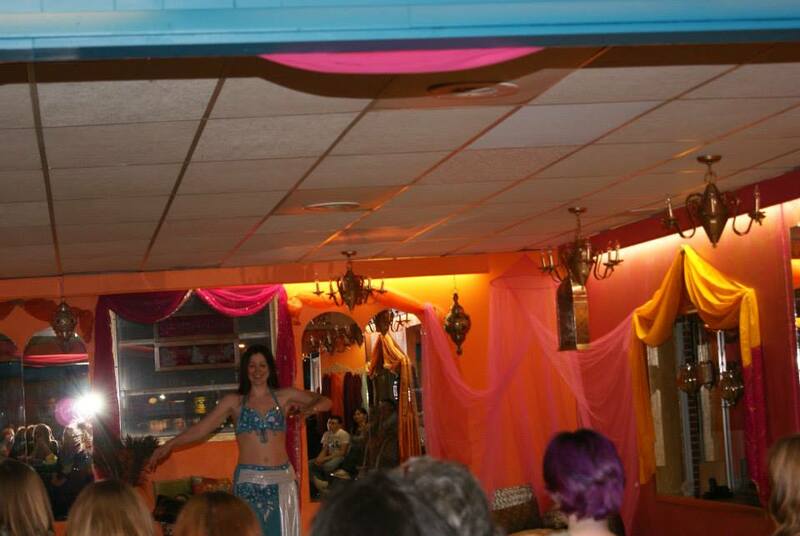 So, my big hafla this past Saturday. It went well. :) I was nervous because I had many more people than usual attending to see me dance, and you know, you really don't want to screw up and make a fool of yourself. I like to keep those humility-inducing occasions to an absolute minimum. The day started off fairly hectic with a trip to see the twins (so cute! I would *still* be kissing their faces if they were here) and then an attempt to straighten the house and bake red velvet cupcakes for Anne's birthday party the following day. Well. I shouldn't be allowed to bake, let me tell you. Cooking I'm good at, but baking? Even making something out of a box appears to be just too much for me to handle. As evidenced by my work product every.single.time. I mean, *every* time! What is it with me? Do I not have the baking gene? I don't know, but it ain't pretty. I read the box carefully (snort!). I painstakingly measure out one and a quarter cups of water. Next comes the vegetable oil. My brain tells me that the box just said to add one and a third cups of oil. "Gee, that sounds like an awful lot of vegetable oil," I say to myself as I fill up a measuring cup and dump it in. WHEN YOU HEAR THAT LITTLE VOICE OF DOUBT IN THE BACK OF YOUR MIND, LISTEN TO IT. Did Tiffany listen to the voice? SHE DID NOT. The instant the oil hit the mix I knew something was wrong. I carefully pick the box back up and examine it. It did NOT say to add one and a third cups of oil. It said to add *one third of a cup*. Yeah, that's a big difference. I had only put in one cup at that point but seriously gentle reader, THAT'S STILL A LOT OF OIL. I panic. In a lucid interval, I realize that the oil has not absorbed into the mix, so I can dump some of it out. Said dumping is undertaken. I eliminate much of the oil, but I don't get all of it, and the mix does need *some* oil, so I leave the rest. I'm feeling anxious about continuing on, but going to the store to get another mix is just not a possibility given the schedule I have for Saturday. Mike is on a Cub Scouts hike with Hank, and poor Anne has been abandoned in front of the t.v. watching Dora so that I can bake and hear myself think at the same time. After my baking attempt, I have tons of dance preparation to do and I just don't need this complication. In a frenzied call to my sister, she suggests scraping the mix and making the cake from scratch. It's not a bad suggestion, but I know I'm not up to the task. If the mix fails Plan B is to go to the bakery and buy a cake. I continue on with the mix and pray for the best. As I talk to Shauna'h, I try to spoon the mix into the cupcake wraps. Right, it was runny. Far too runny to be normal. I contemplate crying, but instead do the mature thing and just messily continuing spooning the mix in while swearing at it. I stick the cupcakes into the oven. They puff up quickly. That seemed abnormal but then again I was really feeling paranoid by that point. As they finish I really thought I was going to have to run to the bakery, but an inserted toothpick comes out clean, much to my shock. I let them cool and notice that they are all greasy on their little cake cup bottoms. "Your mission, should you choose to accept it: get everybody drunk so that they don't notice the cupcakes. Go!" Ok, so back to dancing. I was nervous. I packed up 3 costumes, all my assorted dance junk, practiced all my numbers, and told myself that I was excited and ready to dance like I may never belly dance again. I'm not making that up, I *really* told myself that. Out loud. In the car on the way to the studio. Yes, I was talking to myself. Desperate times call for desperate measures. I was already shaky enough from the cupcake debacle. I arrive, drop off some hummus at the potluck table, and suit up. I'm nervous. Really nervous. We had a group number first, in the new gold costumes. It went fine, but my veil got caught on my top and resulted in a yank followed by a rhinestone rocketing off my chest at an alarming speed and into the audience. Oh, and I couldn't get my veil tied around my hips at the requisite moment, but I'm happy to report that I did not panic. I refolded and reapproached and it did tie nanoseconds before I had to turn around. Then when I had to *untie* it for the dramatic finale it gave me a hard time coming untied. Have I mentioned that I frequently hate my veil? He and I do not get along as well as Sword and I do. Anyway, dramatic finale. The audience was kind of quiet, that happens a lot when we dance with canes. Perhaps people are scared. :) Other group numbers followed, and then our group had another piece. That one went really well aside from a bad traffic pattern at the very beginning. Then it was time for the solos. Sweat + Shaky = Not a Good Combination When You're Going to Wield and Try to Belly Dance with a Sword Balanced on Your Head. I'll spare you the nausea-inducing lead up details. Suffice it to say I was feeling uneasy. But I had prepared, what more could I do? Claire placed my sword. I was introduced. My music started. I strut out. The beginning was really good. I had a little sword lead up process that worked really well. When I picked the sword up, I balanced it on my arm to carry it up to the audience. Really hard to see, but that's what I was doing. :) Mike, my photographer, was sitting toward the back. I balanced it on my hand a bit, and generally swirled it around while I danced prior to balancing it on my head. Then the big moment arrived. I lifted it to my head. Everybody is staring at me. This is the moment that I remember from the restaurant that made my heart stop, but this time I was prepared for it. I placed the sword and I *knew* that I was going to feel that it was unsteady. I gave it one more nudge to "screw it in" for good measure and took my hands off of it. It stayed on. I knew that would happen, but it's still quite nerve wracking, as you can imagine. People applauded, which made me happy. I danced, and I knew that I was nervous, and you know, I was dancing with a sword on my head, so it's not like I could go crazy. I traveled a little, dipped down (one of my favorite sword tricks) and generally tried to call to mind movements that fit with the music. It went well. I spun at the end, which earned me more happy applause. I didn't spin at the restaurant because I was just too nervous, so I felt really good to have gotten back on that horse. Soon enough, the music ended and I struck my final pose. I always feel like my practicing goes better than my performing because my performance nerves diminish my dance ability a bit. But every time I perform that gets better and better. And I felt good about the performance. It was definitely worlds better than my sword dance at the restaurant, and I got lots of very nice compliments from the audience after the show. They loved Sword as much as I do. I even had someone ask if they could take a picture of me with it. That last photo is fantastic. Great job! The difference between a good cook and a bad cook is that a good cook calls that sort of performance with a boxed mix "success." There was too much oil in, you scooped it out, no problemo. At least that's what *I* would tell myself. I hardly ever follow a recipe to a t. I just kind of dump stuff and hope. Usually everyone likes it, so ... I guess it works!